and inscribed on reverse "Leicester Square, The Empire" and "By George. Coronation Review". Also signed on reverse "Geo Hyde". The coronation of King George V and Queen Mary took place at Westminster Abbey on 22nd June 1911 and was celebrated by the Festival of Empire at Crystal Palace and other events around London, including "By George. Coronation Review" at the Empire, Leicester Square. Born in the Nottinghamshire village of Radliffe-on-Trent in 1867, George Hyde-Pownall was a professional artist but also a successful musician and composer. Records show that in 1881, when George was fourteen, the family was living in Lenton, Nottinghamshire, where his father made a living as a gardener. George studied music in London and was a well known tenor by the early 1890's being on the staff of St Andrew's Wells Street and Westminster Abbey. He was also pianist of the vaudeville orchestra at St George's Hall, Marylebone. 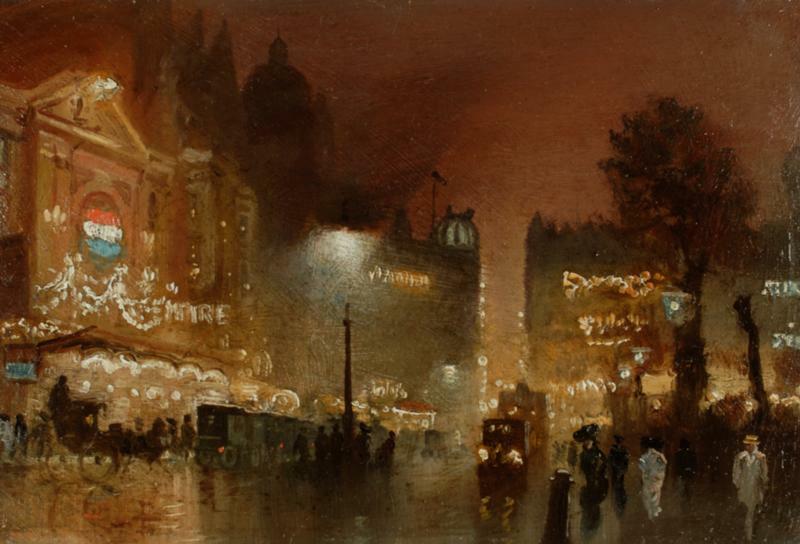 When he wasn't performing he painted, mostly in oils on a small scale and is best known for his evocative views of London and scenes of city life, often at night. Favourite subjects included Piccadilly Circus, Leicester Square, Westminster, Tower Bridge and St Paul's Cathedral. He worked in the tradition of Whistler and Atkinson Grimshaw but was more greatly influenced by the Impressionists. In 1911 George went to Australia to continue his very successful musical career. He seems to have spent the rest of his life in Australia, living in Melbourne and often touring. He died in 1939 at St Kilda outside Melbourne aged seventy two. Collections: Melbourne City Council and the Victoria and Albert Museum.